Division II Bentley University takes the title. Holy Cross’ Zychowski is medalist. Brewster, Mass -- Teams from 35 colleges and universities across New England gathered Sunday through Tuesday, October 16-18, 2011 for the 77th Annual New England Intercollegiate Golf Championship. The event attracted 168 golfers to The Captains Golf Course and its 36-hole layout on Cape Cod. NEIGA was pleased to have Cleveland Golf / Srixon return as the ‘Presenting Sponsor”. The New England Intercollegiate Golf Association (NEIGA) has been in existence since 1934 and includes 44 member colleges and universities in New England and is considered to be the oldest and largest college golf tournament. It is unique in that Divisions I, II and III compete together. 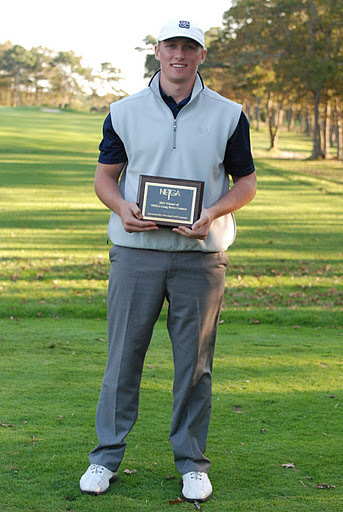 Division II Bentley University, under the leadership of Coach Mickey Herron, won the overall championship with a two-day score of 606. Bentley started the day four strokes behind Bryant and Holy Cross. Division I Bryant University led the Division I teams with a score of 607. The Division III champion with a total of 617 was Salem State University.